Listed below are common questions about the FloShield system. Don’t see what you’re looking for? Please feel free to contact us for additional information. Is there more than one version of FloShield? FloShield Plus is a more comprehensive solution to maintaining a clean lens throughout an entire laparoscopic case. It not only provides the active lens protection inherent within FloShield Air but it provides the surgeon with the ability to clean the lens intraoperatively without having to remove the scope from the surgical site. We call this Flo-X in situ. It is perfect for longer cases where there is a lot of energy use, or for the surgeon who wants to virtually eliminate the need to remove the scope from the surgical site. Can I use FloShield on my robotic laparoscopic cases? Yes. Robotic FloShield is specifically configured for the 8.5mm da Vinci® Si HD™ Surgical System laparoscope, and accommodates 0° and 30° down angled lenses. FloShield can be used for both multi-port and single-port robotic assisted surgical procedures. Is there a 30° up angled lens for the daVinci® Si HD™ Surgical System? This product is currently being developed and is not available for customers at this time. Please check with your local representative regarding your interest in this product. How many cases have been performed with FloShield? Over 13,000 cases have been successfully performed with the 5mm and 10mm traditional laparoscopic versions of FloShield. The recently launched Robotic FloShield Plus is nearing 1000 procedures performed. Is the FloShield system reusable? No, the FloShield system is single use only and fully disposable. FloShield replaces all other laparoscopic clarity products, costs only slightly more than a trocar, and is a fraction of the cost of surgical staplers or energy instruments. If FloShield saves 10-20 minutes in a two-hour case, it pays for itself many times over. The benefits to using FloShield include increased focus/concentration during a case with dramatically fewer interruptions, rapid vision recovery after an abrupt loss of vision and maximizing the visual benefits of modern optics and displays. How does FloShield’s Vortex Barrier Technology work? FloShield’s tubing connects to the existing insufflation tubing and diverts a portion of the CO2 gas down through four unique microscopic channels to the distal tip of the scope. The unique patented design sends the CO2 gas down the channels at varying speeds creating a vortex barrier of CO2 gas at the lens of the scope. This vortex provides a barrier of dry gas over the lens that shields it from condensation, debris and smoke and instantly defogs the lens. Flo-X is a cleaning surfactant used to clean the laparoscope lens. Flo-X is biocompatible and is much more effective as a cleaning agent than plain water or sterile saline. The user may apply Flo-X onto the lens outside of the patient or it can be dispensed intra-operatively using FloShield and Flo-X in situ. The ingredients used in the solution are docusate sodium, saline and phosphate buffer solution. Docusate sodium is a surfactant that is commonly used throughout the pharmaceutical industry. It is FDA approved and has been safely used for years in many health care products. The only contraindication for the use of docusate sodium is sensitivity to the product itself and this is extremely rare. How do I use Flo-X in situ? Flo-X in situ is the only method of cleaning the lens that can be accomplished without removing the scope from the surgical site. FloShield Plus comes with two syringes containing 10ml of solution in each syringe. A syringe is connected to the Flo-X dispenser on the tube set and the user will normally dispense approximately 2ml of solution each time the lens needs to be cleaned. The clinician slightly depresses the syringe to release Flo-X on the face of the lens. The flow of solution is stopped by removing finger pressure on the syringe. What is the Flo-X Blow-Off Bulb used for? After dispensing Flo-X onto the lens intraoperatively, it is suggested that the blow off bulb be squeezed 2-3 times in order to provide a bolus of CO2 gas over the lens to aid in drying the lens. It takes approximately 5 seconds for the lens to dry. More than three squeezes of the bulb are unnecessary. Why do I need to use the Trocar Vent? FloShield diverts a portion of the CO2 gas from the insufflator in order to create the Vortex Barrier at the distal tip of the laparoscope. To maintain a constant fog free and debris free lens, it is critical to provide a consistent nonstop flow of CO2 gas and this requires the insufflator to be in an “ON” mode throughout the entire surgical case. By placing the Trocar Vent on a trocar and turning the stopcock on, this will ensure that FloShield’s Vortex Barrier Technology will provide visual clarity throughout the entire case. Why do you state that FloShield virtually eliminates the need to remove the scope during surgery? Our stated goal is to ELIMINATE the need to remove the laparoscope while maximizing the visual clarity over the course of the entire MIS procedure. In one clinical assessment of 30 cases3, the clinicians dramatically reduced the need to interrupt surgery to clean the laparoscope by over 99% when using FloShield Plus (the data showed that the overall scope removals went from 6/hour to 0.005/hour). However, experience has shown us, that there are occasional times when the debris and smoke seem to “bake on” the lens. This has been observed to be true in long cases and/or cases with a high utilization of electrosurgery/ultrasonic energy. Thus, we have reduced the number of scope removals when utilizing FloShield Air, and virtually eliminated the need to remove the scope with FloShield Plus. Is any capital equipment required? No capital equipment is required. What other products do I need use in order to maintain consistent visual clarity throughout my surgery? Does FloShield fit all laparoscopes? FloShield is compatible with the majority of available traditional laparoscopes including Storz, Stryker, Olympus and Wolf. FloShield comes in both 5 and 10mm sizes with 0, 30 and 45 degree angled options in both standard and extended lengths. For Robotic Assisted Surgery, we have developed Robotic FloShield specifically to work with the 8.5mm, 0 and 30 degree down laparoscopes utilized with the da Vinci® Si HD™ Surgical System. What size Trocars do I use with FloShield? In order to accommodate the FloShield sheath, you must use a 7/8mm trocar with a 5mm laparoscope and a 12mm trocar with a 10mm laparoscope. 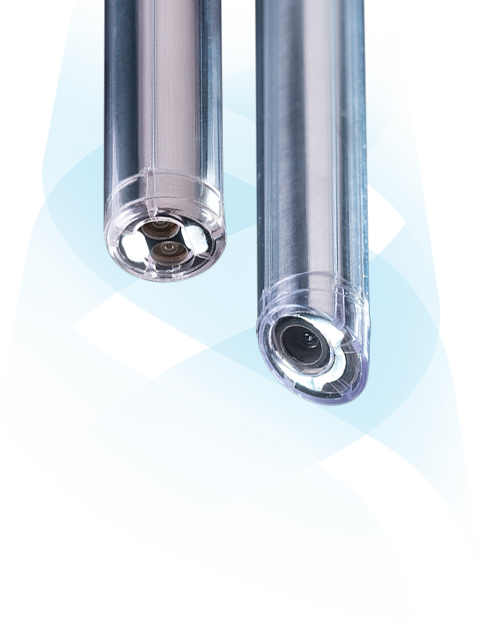 For the Robotic FloShield designed specifically for the da Vinci® Si HD™ Surgical System 8.5mm scope, you must use a 10mm or larger trocar (i.e. 11mm or 10/12mm trocar). Is there any clinical data available on FloShield? A retrospective study1 demonstrated a time savings in Roux-En-Y bariatric surgery. A small prospective study2 demonstrated a clear difference in the number of times surgery was interrupted for cleaning during laparoscopic cholecystectomy. In a clinical assessment of 30 laparoscopic cases3, the data showed that the clinicians went from an average of 6 scope removals per hour to .005 scope removals per hour when utilizing FloShield Plus. MID Surgical White Paper Series for Efficiency and Saving Time During Laparoscopic Surgery; Time and Cost-Savings with an Experienced OR Team using FloShield to maintain a Clear Image During Complex Laparoscopic Surgery. MID Surgical White Paper Series for Efficiency and Saving Time During Laparoscopic Surgery; Decreased Need to Interrupt Surgery to Clean the Laparoscope During Laparoscopic Cholecystectomy using the FloShield System. McKenna D, Burchett M, Choi J, Mattar S, Selzer, D; Indiana University Medical Center; A Novel Device Maintaining Clear Optics During Surgery; SAGES 2013, Session: Poster Presentation, Program number: ETP033, April 17-20, Baltimore MD.